Vista Rock is not the highest rock outcropping in Central Park, but it is the most dramatic and impressive. Vista Rock rises out of the placid waters of Turtle Pond and presents a jutting, fanged rampart of dark orange and black rock. Crowned by the walls and tower of Belvedere Castle, the overall impression is reminiscent of the medieval fortresses found throughout Europe. Unfortunately for climbers, Vista Rock is now solely a visual treat. Climbing has been banned for almost a quarter century on its cliff faces. Even more unfortunately, the top of Vista Rock has been fenced off to any and all park visitors. Prior to 1998, the northern gazebo stairs took visitors right out onto the top of Vista Rock where they were allowed to sit, stroll, take photos, picnic or just lay in the sun. Frederick Olmstead designed this massive outcropping with a few well-placed explosives (see: Blast Hole route) for the expressed purpose of providing a vista point for park visitors. Hence the name. As you can see from the archival photo presented on the Vista Rock 2 page of this site, visitors were welcome to enjoy the top of Vista Rock since the park was originally built. As for the ban on climbing here, the loss of Vista Rock was barely felt in the local climbing community. Serious climbers were far more focused on the problems at Rat and Cat Rock. 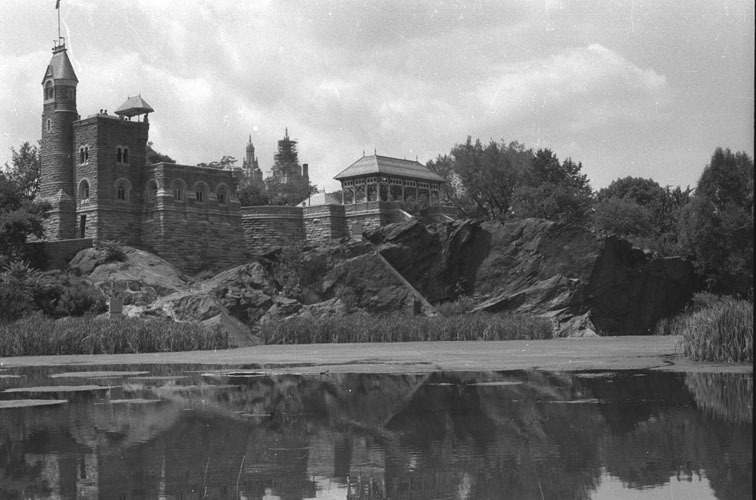 Indeed, Vista Rock provided the cornerstone of a precedent-setting agreement between the Central Park Conservancy and the City Climbers Club of New York (eventually just City Climbers Club). When the founders of CCNY originally approached the city about getting climbing recognized as an established and legitimate activity in Central Park with their stated goal of obtaining as much access as possible to the most popular boulders, they had in mind a bargaining chip. A gesture of goodwill. Vista Rock. The founders well understood the precarious nature of Vista Rock as a climbing site. First, it was located at a site of maximum visibility. Second, the castle was also where many children's programs took place. It seemed in the best interest of all involved to avoid giving young, non-climbers a visual incentive to mimic the risky behavior of experienced rock climbers. However, it must be noted that before this climbing ban, most rangers and park law enforcement officers were of the mind that people were allowed to climb or clamber on Vista Rock as long as they did not use ropes or other types of climbing equipment. 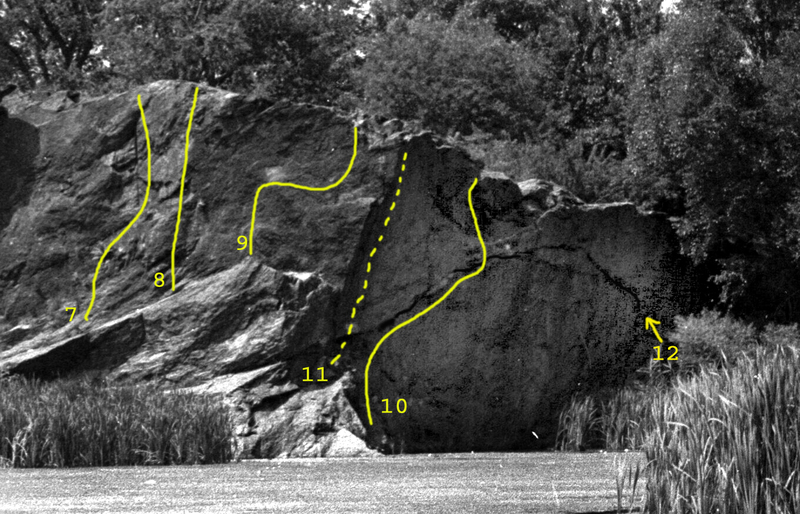 The members of the CCCNY were primarily focused on establishing access on the smaller boulders like Cat and Rat Rock and since the routes worth doing at Vista require the hassle of a top-rope and anchor gear, the decision to make the Conservancy the offer of banning Vista Rock was seen as logical. 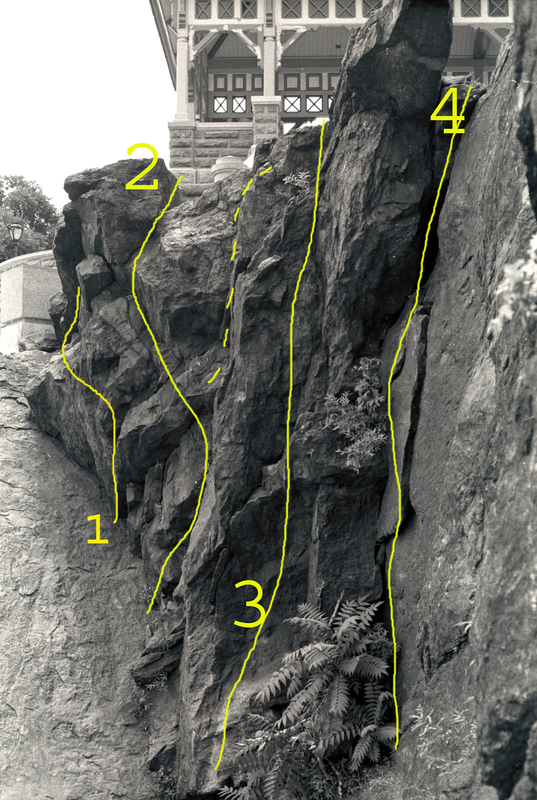 Since that 1990 agreement, however, climbers have reported to this guide that park officials have driven climbers off many of the boulders and areas that the CCCNY had originally negotiated access to. Hopefully such reports are anomalies and do not represent a rescinding of the original agreement. On the other hand, if it is eventually revealed that the Conservancy has indeed made the CCCNY agreement null and void, that would mean the self-imposed ban of climbing at Vista Rock is also lifted. Going far beyond the climbing ban, the city eventually decided that allowing anyone access to any part of Vista Rock was a bad idea. This was mostly likely done in 1998 as part of the Turtle Pond "restoration" project. Since then, plumes of algae began choking Turtle Pond while large swaths of ivy started growing across the main face of Vista and small trees have taken root at its base. Climbing there is now, without a doubt, a thing of the past. But climbing did happen here. Vista Rock was enjoyed by local climbers for decades and there are few places like it in the world. The experience of climbing above water on short, high-quality cliffs in the middle of Manhattan is unique and pleasurable. Vista Rock offered a number of routes in the 5.5 - 5.10 range that were absolutely worth the time and trouble. From 1984 until 1990 it was not unusual to walk by and find several top-ropes hanging on Vista with a number of experienced climbers scrambling about, belaying and lounging in the sun. This guide describes the climbing at Vista Rock for historical puproses only. I have provided the route names and descriptions purely to record events of the past. This information is solely for the education and entertainment of people interested in the history of climbing in New York City. Nothing here should be construed as permission or encouragement to climb at Vista Rock. Vista Rock was never a proving ground. It was never even that popular with climbers, despite its size. The features of Vista Rock, with the low slanting ledge, the slab block, the bad landings, the water landings, the hard-to-rig anchor placements for the main face routes, all conspired to keep the vast majority of climbers at Rat and Cat Rock. However, there are a number of excellent routes here that provide good rock, good moves and abundant exposure. The Friction Slab was fun for beginners. Extremely experienced climbers enjoyed free-soloing the Blast Hole route straight up the main face of Vista Rock. The Overhanging Corners provided those seeking early top-rope experience with three quality routes in the 5.6 - 5.10 range and very easy anchor placements. (Or, again, more free-soloing for those confident on more difficult terrain.) The Main Wall offered two high-quality face climbs (Buena Vista and Black Face). And when all is said and done, when all the various natural outcroppings are taken into consideration and evaluated, the highest quality natural rock route in all of Manhattan turns out to be here. At Vista Rock. On the hard-to-access eastern face of the Friction Block: Rusty's Revenge 5.10. My own climbing history converged with Vista when I made my first roped ascent ever. Wearing sneakers and a borrowed harness, I ventured high above the ground, and a window opened to me. Protected only by a rope and harness, I had made my very first ascent on a route high enough to kill me. Looking out and beyond, I could see the Gunks, the Tetons, all my future ascents. I became a climber at Vista Rock. And because of that, it will always hold a special place for me. 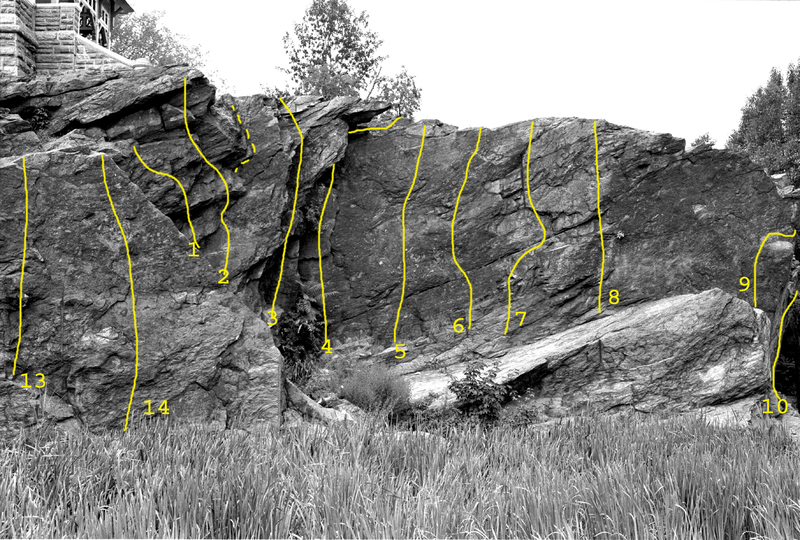 This guide breaks Vista Rock down into four distinct sections: a) The large, attached block with a small, steep eastern face and a low-angled slab on the north. b) The blocky, overhanging corners above the Friction Slab. c) The Main Wall or East Face. d) The large overhanging face on the dark North Wall. Start: Not quite half of the way up the big corner on the right side of the obvious Friction Slab. Go: Reach up to a large, v-cut hold on the overhanging bulge. Move up (crux) and left and finish at top. Start: One third of the way up the big corner on the right side of the Friction Slab. Go: Move right onto the right face of the corner via a large flake. Up to small overhang and over on the left side (crux, exposed). Continue a few more moves past a blocky finish. *Variation: Instead of climbing the small overhang, continue to follow the large flake on the right-hand wall. Go: Straight up past two small overhangs. Start: Just right of Double Overhang Corner, directly below obvious large flake that sits under a large horn of rock at the top. Go: Move up to and past large rectangular flake (often has plant-life growing out of it) to the overhanging horn. Continue either under the horn (dirty, awkward) or around right of it (scary) or straight over (bouldery, exposed). Start: A few feet to the right of Flake Route, under a shallow depression in dark face of the main Vista Rock wall. Go: Climb up and slightly right to small stance in the shallow depression. Continue over the bulge (crux) to top. Start: Four feet or so to the right of Buena Vista, on the right side of a black, friable bulge. Go: Race up and left over bulge, then up the face until one can reach a large slanting edge off to the right (being careful not to move onto the larger holds of Blast Hole) and over the top. Start: 7-8 feet right of Buena Vista, just left of an obvious shelf and blast (drill) hole on the main face. Go: Climb small left-facing corner and flakes to shelf, then continue up blast hole to the top. Start: A few feet right of Blast Hole, under steep, dark face. Go: Climb straight up to top. *Good face-climbing. Much better than it looks. Start: 6-8 feet right of Black Face, underneath black and orange face that is obscenely friable. Stand on the little ledge at the very end of the sloping platform. Go: Lunge high to big orange bucket (easier if taller). Hand traverse right and either mantle or reach high for another hold and gain a stance just before the arête. Then continue easily to top ... where you can then clean your pants. *Not your run-of-the-mill 5.7 The first known ascent was an onsight free-solo. Start: 8-10 feet beneath The Lunge and Arrested Arete, on a small slab just above the water. This is the eastern end of the overhanging North Wall -- at the end of Aid Route. Go: Follow the thin arching crack on the overhanging wall up and right over the water. One hard crux move gains bigger holds. Power up and into the big depression/small cave above. *Short, but exciting. A taste of what might-have-been had there been attempts at free climbing the Aid Route. 11. Arrested Arête 5.11d - 5.? Start: A few feet above the small slab start of Vista Vision, beneath the overhanging, imposing arête formed by the ends of the Main and North Walls of Vista Rock. Go: Up an awkward start to gain the arête on the left. Continue straight up with the arête for the left hand and small edges and smears for the right hand and feet. The big hold from The Lunge is not off-route, but do not finish on The Lunge. Continue up the arête to the top. *A very hard route attempted several times, but never completed. From the start to the big hold on the left side of the arête is hard 5.11. Beyond that is unknown. Using the big hold from The Lunge allows for a rest, but regaining the arête is most likely harder than just moving straight up the arête in a single push from start to finish. **On the last attempt, when it seemed like the final moves might go, the climbing was interrupted by local police officers who happened upon the scene. Go: Aid out along the thin, arching crack lines over the water. *Last climbed in 1985 (as far as we know), this route is not often attempted because of the logistical difficulties which include climbing at night to avoid the authorities. The grade above is given for the technical aspect of the route. As of 1993 there were still a few old rusted pitons sticking out of the crack. Bring RURPS and hooks. **Many considered this line to have the potential of being one of the hardest and finest inner-urban rock routes anywhere if free-climbed. To date, no one has claimed a free ascent. Detail photo showing the overhanging North Wall of Vista Rock. Aid Route follows arching crack.